REFLECTIONS ON THE PRACTICE OF QI GONG. Over the past period Singing Dragon, along with other indie publishers and self published practitioners, have unleashed an avalanche of material on qi gong practices – basic and complex – in both book and DVD formats. As I’m always reflecting on my own practice I thought it would be good to introduce some of the material that is now available. Back in the early Eighties, when I first took up Yang family taijiquan, we were not taught any supplementary qi gong exercises. I was first introduced to qi gong on a visit to Compendium books in Camden town in 1985 when I bought Yang Jwing-Ming’s Chi Kung – Health & Martial Arts. That book introduced me to the history of Qi /Nei Gong and exercises like the Shaolin Temple’s Da Mo Wei Dan and Marshal Yueh Fei’s Ba Duan Jin / Eight Pieces Of Brocade which had evolved from various esoteric practices over hundreds of years. It connected the exercises with the Chinese medicine and the acupuncture meridians and explained basic things like why, when we practice taijiquan or qi gong, we place the tip of the tongue on the roof of the mouth. Since those times I have had the opportunity to learn from several internal martial arts teachers and through them encountered different methods of qi development and circulation. 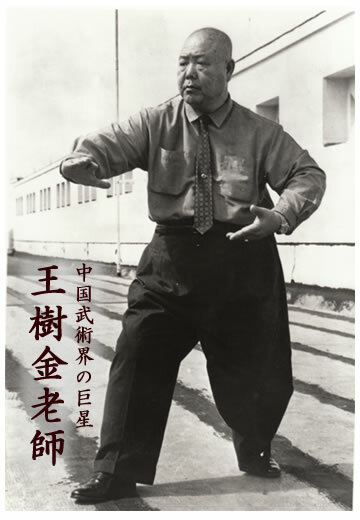 As my own health is not great, due to smoking cigarettes from a young age, I have consistently experimented with different sets of exercises that profess to be both beneficial to ones health and also to the system of martial arts being practiced. At a certain point I abandoned Yang taiji and sought out lessons in xing yi quan and bagua zhang. Through Marnix Wells I discovered Wang Shujin’s nei gong set which was handed down from Yi Quan/Dacheng Quan master Wang Xiangzhai and began to understand the vital importance of standing! 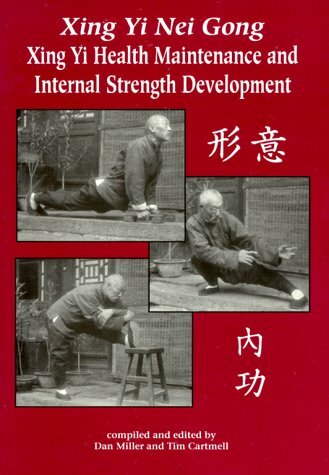 Through reading Tim Cartmell and Dan Miller’s Xing Yi Nei Gong I discovered and enjoyed Wang Jiwu’s health maintenance and internal development exercises. In turn, I discovered Wang Jiwu’s fascinating xing yi quan brother Hu Yaozhen, who studied Daoist cultivation and taught neigong to the late Hunyuan Chen taijiquan master Feng Zhiqiang. For an insight into Feng Ziqiang’s system seek out footage of him on YouTube. Also worth checking is hard working Canada based Chen Zhongua who teaches Chen taijiquan – a combination of Practical Method & Hunyuan – and maintains a consistently interesting YouTube presence. As I get older I’m less and less interested in accumulating forms. I feel drawn back to working on on and exploring the basics – the foundation. My current Chen taijiquan teacher, Shifu Liu Quanjun, is a 6th Duan Wei level instructor and a disciple of Grandmaster Master Chen Xiaowang. 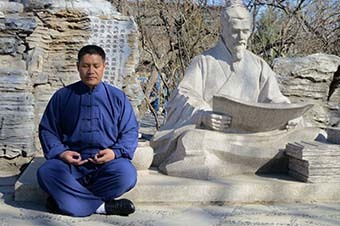 While the Chen family system – as its taught in Chen Jia Gou village in Henan – seems to limit qi gong to basic standing practice (zhan zhuang) through Shifu Liu I have been introduced to the Six Healing Sounds (based on Om Ma Ni Pad Me Hum) and the first half of Da Bei Qi Gong which contains both active and meditative forms previously unknown in the UK. He also teaches Ying Qi Gong / Hard Qi Gong – an internal/external steel jacket training programme originating from Tibet- but as it apparently requires one to cease using medications for 100 days and is costly to learn I have devoted my energies elsewhere. So, while it’s generally agreed that one needs a teacher to practice Qi Gong as certain esoteric practices practices can be hazardous to ones health it also the case that there are many forms which are easy to learn and simply require one to practice on a daily basis. 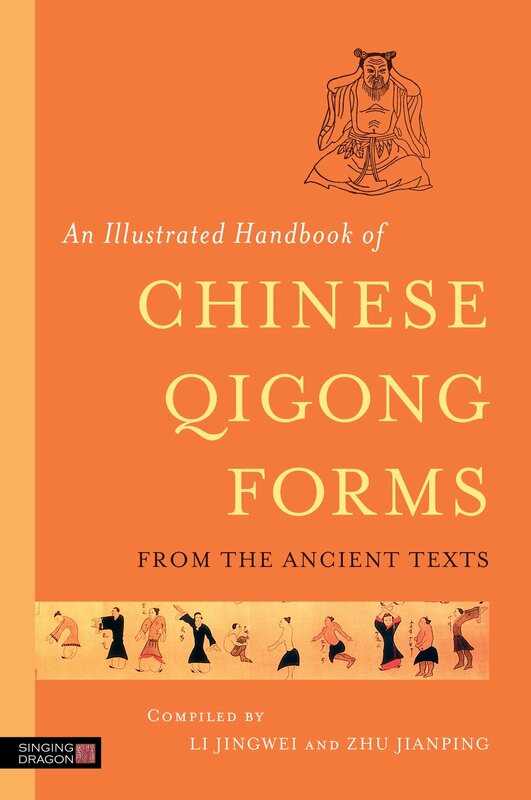 To get a historical overview of Chinese Qigong which goes back some 2000 years I heartily recommend An Illustrated Handbook Of Chinese Qigong Forms From the Ancient Texts by Li Jingwei and Zhu Jianping. This is a nicely presented and thorough piece of research which proceeds to illuminate the evolution of Chinese Qi Gong in chronological order. The compilers visit the source from which the exercises are derived. They provide a description of the ancient form, its health and other benefits, uses, and how to do it. Each form is accompanied by drawings based the original illustrations where these exist, or line drawings of the movements described where the original text was not illustrated. Though the book provides a direct link to authentic ancient forms and maintains they are easy to learn, and easy to do, I feel this could prove a little frustrating. It’s basically a resource and in these times it would be far more productive to explore the inexpensive series of combined Book + DVD + audio CD that have been lovingly produced by the Chinese Health Qigong Association. For example, Mawangdui Daoyin Shu presents a series of qigong forms based on those shown on the famous silk paintings excavated from the Mawangdui tombs of Changsha, Hunan Province. 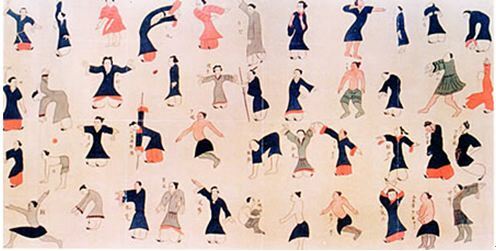 Discovered in the 1970s alongside a wealth of classical texts, they are among the oldest and best preserved silk works in China, and provide a fascinating insight into the early history of qigong. So, if you want to check out a set of Daoyin exercises that go back to the Han Dynasty (206 BC – 220AD) which focus on the essential nature of breath and the movement of animals or birds this could be for you. Daoyin are body strengthening exercises that combine body movement, breath control, concentration of the mind and local massage and like Mawangdui Daoyin Shu the set of Da Wu health exercises fall into the same category. They are are based on a health “dance” that hails from the Song Dynasty -1139 to 1189 – and focus on flexing and rotation of the joints at the hips, knees, toes , shoulders, elbows, wrists, palms and fingers. 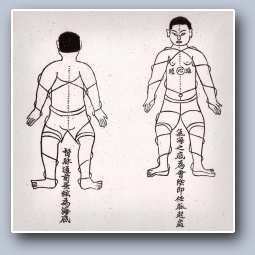 Da Wu employs pulling, stretching, rotating, shaking and rubbing to relieve the joints and stimulate the blood and the qi. A contemporary health preservation set worth visiting is the 12-step Daoyin Yangsheng Yong Shi Er Fa qigong form which is taken from over 50 forms developed by Professor Zhang Guangde, one of the world’s leading qigong teachers. This set of meridian exercises, rooted in Chinese medicine, combine mind, breath and body movement and can be practiced both standing or sitting. Another sitting set Shi Er Duan Jin is also available from the Chinese Health Qigong Assoc and is another modern set compiled from research based on Zhong Li Ba Duan Jin Fa and Shi Er Duan Jin. Thiugh the latter first appeared in the 18th century this is a set tailored to modern needs and due to its combination of stillness in motion it is often practiced as a warm up or closing exercise. The Chinese Health Qigong Association is an organization that popularizes and researches Health Qigong, and is a group member of the All-China Sports Federation. Its aim is to inherit and carry forward the Chinese traditional culture of health promotion and facilitate the communication between Western and Eastern Cultures. Basically, it’s the real deal. The great thing about their publications is the thoroughness of the teaching. It is detailed, they talk you through each posture and you even get to see the teacher do corrections on those demonstrating the form. If you want to begin practicing qigong these DVDs are a good place to start. 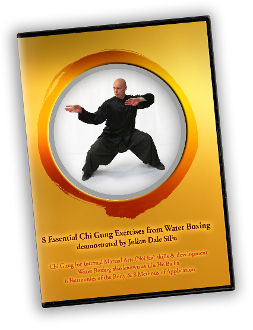 There are 4 other DVDs in the series including Wu Qin Xi: Five-Animal Qigong Exercises and the famous Ba Duan Jin. Oviously, with Qi / Nei Gong one is investing in practices that go back a couple of thousand years and it’s a question of seeking out what suits you and at some point finding a teacher who can guide you through your practice. One can go from excellent but simple sets to a complex and, at times confusing, higher levels of practice. You can get insights into that higher level through the writings of numerous practitioners. For example, Bruce Franzis, who has written several qigong books seems to have taken his teaching of Dragon & Tiger qi gong, xing yi quan, Wu taiji quan and bagua zhang onto a whole new level with his on-line teaching programmes – but he still actively teaches face to face. Meanwhile, two practitioners/authors who feature large via the Singing Dragon publishing house are Master Xongxian Wu and Damo Mitchell. Both are busy traveling the world, teaching and lecturing, and accumulating a devoted following. I’m definitely interested in Master Xhongxian Wu’s study of Dai family Xin Yi WuDao and I’m still reading Damo’s most recent book on The Four Dragons -Clearing The Meridians & Awakening The Spine in Nei Gong, so that stuff is going have wait for another time. In winding up, if you know little or nothing about qigong I’ve provided a few tips and a way in to practice. Basically, I suggest doing a little bit of cross referencing and dive in. Once in, persistence furthers and as the journey evolves you may want to seek out someone who has studied at the source and devoted themselves to their practice. But right now, after writing this, I need to maintain my daily routine and spend the rest of the afternoon practicing while paying special attention to the neck and shoulders. This entry was posted in Deep stuff, Just Runnings, Wushu and tagged Bruce Franzis, Chen Taijiquan, Chen Zhonghua, Chinese Health Qigong Association, Damo Mitchell, Feh Zhiqiang, Internal Martial Arts, Nei Gong, Qigong, Shifu Liu QuanJun, Singing Dragon, taijiquan, Xhongxian Wu, xing yi quan. Bookmark the permalink.